The bad news is that it is a herniated (or "slipped") disc, not just a protruding (or "bulging") disc. This means that some of the liquid in the disc has leaked out of disc into the medulla, and is compressing the nerves there. I always wondered what a "hernia" was, as it seemed to refer to all sorts of different complaints - it appears to be a medical term for being in the wrong place at the wrong time. I believe that this is harder for the body to fix with the help of physiotherapy than a simple protruding disc. So what's the good news? Well, according to the doctor, about 80% of patients in my condition manage to improve without the need for surgery; the remaining 20% end up going under the knife. And this coming from a surgeon who presumably has a natural inclination to surgery. If I think that that 80% includes people of all shapes and sizes, ages and levels of fitness, it makes me think that I have a pretty good chance of making that 80%. After all, I am in good shape and, when I put my mind to something (like following the exercises my excellent physiotherapist recommends me), I take it very seriously. So how did this happen? The doctor said it could just have been down to bad posture. I can't help wondering if one of the sessions with an osteopath was the straw to break the donkey's back (or Rob's neck). It doesn't really matter. The point is that, until the symptoms have gone away, I am to avoid any impacts (no running), avoid lifting heavy weights (no more painting of sheds and, in general, a great excuse not to do anything I don't feel like doing ha ha) and avoid bad postures. I have to have a EMG (Electromygraphy) test to see if I have any nerve damage and to monitor my progress. Meanwhile, my physiotherapy is focusing on strengthening my shoulders and neck, as well as stabilizing my pelvis. It's been a few weeks since I last bought a gadget, so let me introduce the latest in my collection: The Stabilizer. 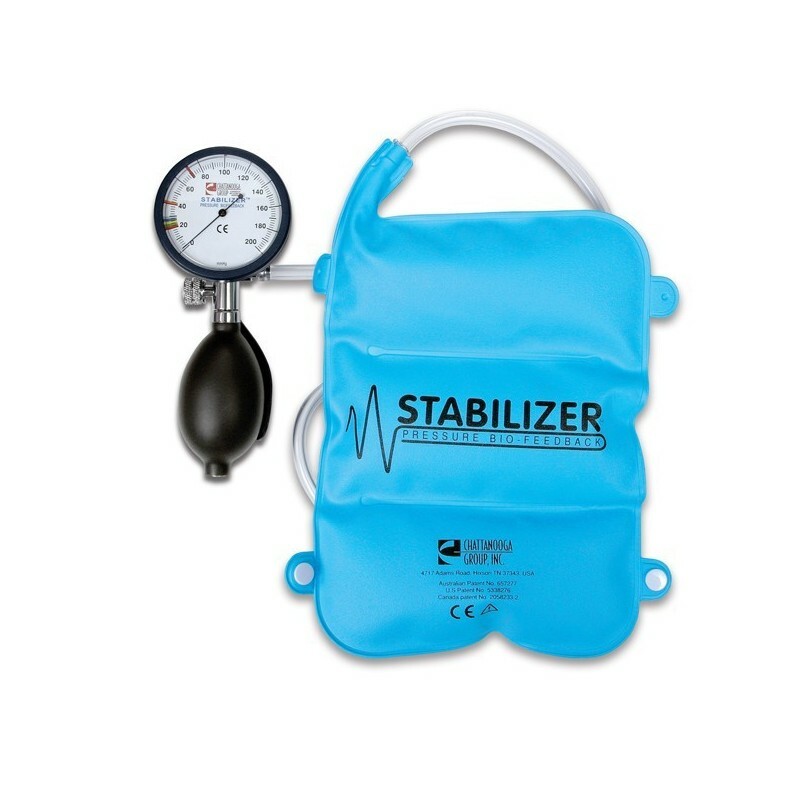 By inflating the cushion and placing it under your lower back as you lie face up with the legs bent, you can make very controlled movements monitoring all the while the pressure gauge. This allows you to - say - practice lifting the legs while focusing on keeping the pelvis perfectly stable. I bet my wife I could do it better than her (based on her poor posture when running) but I had underestimated the power of Pilates, and she absolutely trounced me. When we got married she still had a "six pack" and was able to support my entire weight standing on her stomach. Having two kids meant that these muscles separated but I think some of her postural problems come from having overworked the exterior core muscles (doing crunches and the like) and ignoring the internal core muscles (by not doing "planks" etc.). As you know, I love anything that is measurable, especially something like this that gives you instant feedback on how well you are doing. I've also been losing weight more rapidly even than when I have been training for a Marathon. In this graph you can see the first dip as I started my training for New York City Marathon, reaching a minimum on the date of the Marathon itself, then climbing back up to when I started up my training again, this time for the Madrid Marathon. Then, when I got injured, my weight naturally went back up until the last few weeks in which it has gone into a nose dive. People tend to put on weight with steroids (even with the non anabolic kind I have been taking because you get the "munchies"). I've been off the steroids for over a week now and I have been continuing with my Mindfulness Based Stress Reduction course (now in week 6 out of 8). I am still getting away with 1-2 hours less sleep a night than before, feeling much more awake and infinitely less stressed. Of course, I still feel stress from time to time but being more aware of it helps not to fall into that vicious circle of getting stressed about being stressed. Here's to making the 80% cut (or should I say "no cut"?)! I can't believe that hernias can be caused by bad posture. My mother always made a big deal about posture. I should have taken her advice more seriously if she showed me pictures of herniated disks. How do you maintain your exercise regimen with such an ailment? I just wish I would avoid be able to the same experience.